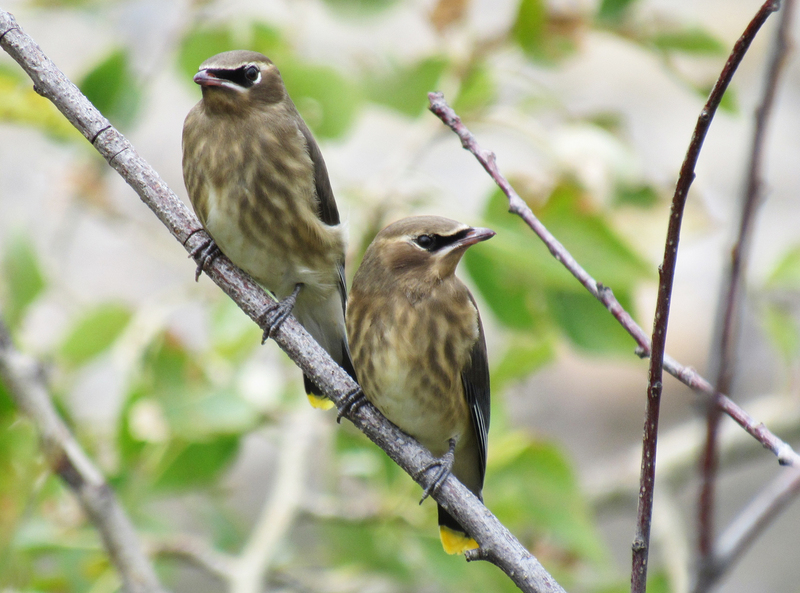 I photographed Carla Wynona and Celine Wendy (two juvenile Cedar Waxwings who may or may not be females) several times over the span of a minute. They never moved! Not even their heads. Not even their eyelids! My five photographs, 10 seconds apart, look exactly the same. I’ve never seen such still little perching birds before. They were ready for their close-up. Great photograph! Lovely pair. Thanks Haunani :-). They did give me an excellent photographing opportunity – totally still and completely visible! Was there a hawk around? Very cool! That’s a good question! It’s so fascinating the way birds just totally freeze when a hawk is around. That makes total sense! I watched the birds from across the river for a while – total bird fiesta. I crossed the bridge to the other side – bird fiesta still going on. I watched the bird fiesta for about 10 minutes and then no bird sounds and no flying. I thought perhaps it was a group food coma but a hawk does sound more plausible. I didn’t hear a crow or magpie warning though (they usually make a huge fuss about birds of prey), but I could have been too engrossed in watching the bird fiesta to notice. All the birds went into hiding except for these “two sisters”, the two Baltimore Orioles and a partially leaf-obscured adult Cedar Waxwing. Except for one of the orioles, who moved his head and eyelids, all the other birds were quite still. Wow. Yeah, that is always amazing whenever we see it here in our backyard – they all freeze. Then we just look for the hawk. Often we don’t see him/her. But it’s interesting your note about the crows – this happens quite a lot here too. Those crows are brave!!! Thanks for sharing your hawk freeze experience. I’ll know to look for a hawk next time. I don’t think hawks usually attack adult crows… but it ain’t pretty when they do. Fascinating…I wonder if their mother taught them that ? I wonder… It kind of looks like they are teaming up for increased joint peripheral vision. Next time I see birds freeze, I’ll look for a hawk. I didn’t think of that at all then. I usually associate a hawk with crows or magpies cawing wildly (and I once heard an American Robin tweeting wildly about a Merlin). It is possible that I was so enthralled by all the feathered cuties enjoying the dark purple berries that I didn’t hear any warning caws, tweets or squeaks. Or maybe the birds just wanted me to go away? LOL! No, the birds love you…I’m sure of it! 🙂 The more raucous birds will sound alarms, but I’ve noticed that smaller birds just go really still and really quiet a lot of the time when a hawk is near. Sometimes the birds stop singing when I get too close. I’m now working on staying within singing distance. I heard an awesome chorus of chickadees and nuthatches today. And then some guy started his lawnmower! Previous Previous post: Two juvenile Baltimore Orioles!! !